It was great. 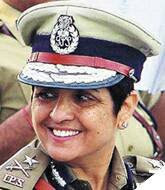 Listening yesterday, to Dr. Kiran Bedi, perhaps, the Best Indian Police Officer the country ever produced. Actually, it is probably right to say that she was the one who produced the best in the Police Officers of India. (Here, in Bahrain, she met the Minister of Interior, Lt. General Shaikh Rashid bin Abdula Al Khalifa, yesterday, and is supposed to have agreed to assist the Ministry's police on community policing and prison reforms). Btw, She is the Civilian Police Adviser in the UN Department of Peacekeeping Operations now. A woman wanting to be a Police Officer was unthinkable in 1972. But not only had she become the first woman who became an IPS (Indian Police Service) officer, but she excelled at her job for 35 years, and brought a whole new meaning to the Police job. She became an inspiration to the women of India. Because she transformed a semingly-uncomfortable profession into a dream-aspiration for many women. Listening to her in Bahrain was a delight, as she eloquently explained the predicaments she faced, the resources she harnessed, the prisoners she reformed, the family she was blessed with. Remembering that what we do today will affect us later, that 'change' is a necessary aspect of life we must all embrace, that the attitude of gratitude is essential, and that Positivism of looking at joys more than at sorrows leads to happiness, was what she put into her lecture. No wonder the organisers, ILA (Indian Ladies Association) gave this, their Annual Leela Jashanmal lecture, the title - Kiran - a Ray of Inspiration !